Looking for the best summer dessert? 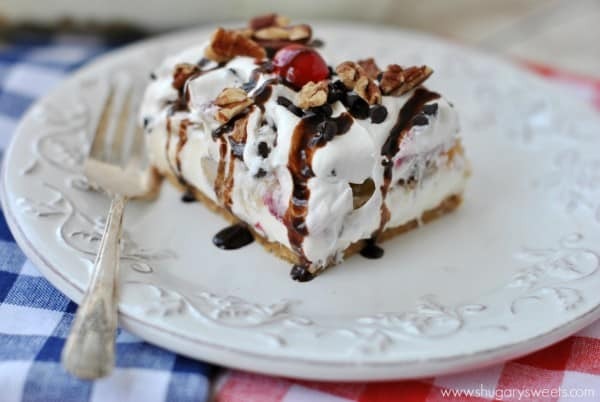 These No Bake Banana Split Cheesecake Bars just might be what you’re looking for! 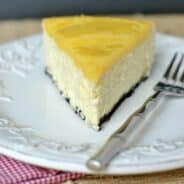 No oven needed, yet delicious rich cheesecake in every bite! Day 3 of Banana Split Week. It’s a winner too. 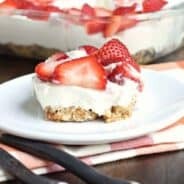 Not any cheesecake….a delicious, easy NO BAKE cheesecake. I win right? Like if there were awards for best Banana Split desserts…I win. Yes, I’m a bit competitive. 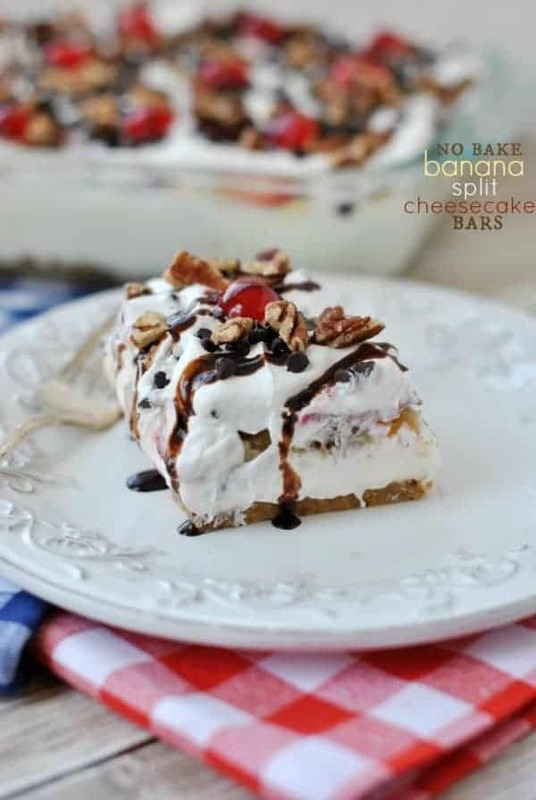 But c’mon….Banana Split Fudge….Banana Split Poke Cake….and now cheesecake. I probably say this at least once every week….but this is my favorite dessert. Yeah, that’s the problem with being a food blogger. You love everything. And each time I bake (or NO BAKE as the case might be), the recipes just get better and better. From the sweet graham cracker crust to the cheesecake filling, these bars have everything you want. And don’t skimp on those salty pecans either. I decided to go with pecans instead of peanuts…you know, to change this up, hehe. Actually, since I’m a Fisher Nut Brand Ambassador (no, this isn’t a sponsored post) I’m fortunate to have a lot of my favorite nuts on hand. And since I just love pecans I knew they would be great on top. Oh, I also added some into the crust. DIVINE. 1. I love banana splits. More than I thought I did. I love the sweet pineapple with banana, strawberries…just LOVE it. 2. I need to eat some lettuce. See number 1. For the crust, combine graham crackers and pecans in food processor. Process until crumbs. Add melted butter. Press into bottom of 13x9 baking dish. For the filling, beat cream cheese with sweetened condensed milk and lemon juice for 3-5 minutes, until smooth and creamy. Fold in 8oz Cool Whip. Pour over graham crust. Top with drained pineapple, sliced bananas and strawberries. Spread Cool Whip over berries. Refrigerate 4 hours or overnight. When ready to serve, sprinkle with chocolate chips and pecans. Top with cherries and drizzle with chocolate syrup. ENJOY. Be sure to stop over and see what my friend Jocelyn from Inside BruCrew Life made for Banana Split Week! I get the competitive thing. You and Jocelyn can duke it out this week for best banana split ideas! But I gotta say, cheesecake will always be a favorite! These are beautiful! Hmmm, I’m going to have to show her this message…basically you’re saying, I win, right? hehe!! Hahaha! Sorry to disappoint ya babe…but I win. No bake cheesecake…and OREO! Booyah!!! 😉 I mean I like pineapple and all, but chocolate beats fruit every time! Ha! But seriously, this is one awesome looking no bake. For realsies! What? This is my blog, you totally don’t win. LOL!!! But yes, OREO is a good thing! Thanks for the pin! Banana Split Week is pretty awesome! I think I just fell in love with banana splits again! This looks incredible! 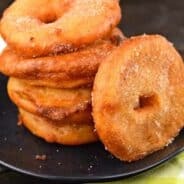 What a great recipe, I have to try this! It looks amazing! Ahhhh….no-bake! I am in on this one! Looks Delish! This looks heavenly!!! 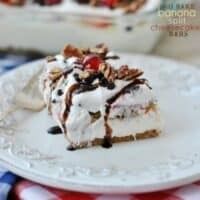 I’m loving all of the banana split recipes this week! Thank you! It was fun coming up with some delicious treats! Just a note to say thank you for this recipe. Made it for July 4and it made my husbands number one dessert. He wants it for breakfast and lunch today also. A big hit at our home. Haha, so glad to hear it!! Thanks for stopping back over and letting me know! Having a new favorite dessert all the time is “side effect” of blogging right?! This looks amazing! Oh my goodness this looks so good, and the chocolate and nuts really top it off 🙂 The best part is you don’t have to bake! There is so much goodness going on here that I am pretty sure my taste buds just fell off my head. And, no bake? I am going to marry you. Pinned! I don’t think I can make it through today without a piece of this! I could seriously face plant right in this! Looks so yummy! I’ve enjoyed your banana split posts! You’ve made me realize I liked them more than I thought I did! Pinned! I love everything about this recipe, the crust, the cheesecake, the banana. Yum! Pinning to try soon. I hope you do try it. It’s seriously amazing. Thanks for pinning!!! Haha, I’m with you on the needing to eat more lettuce thing! 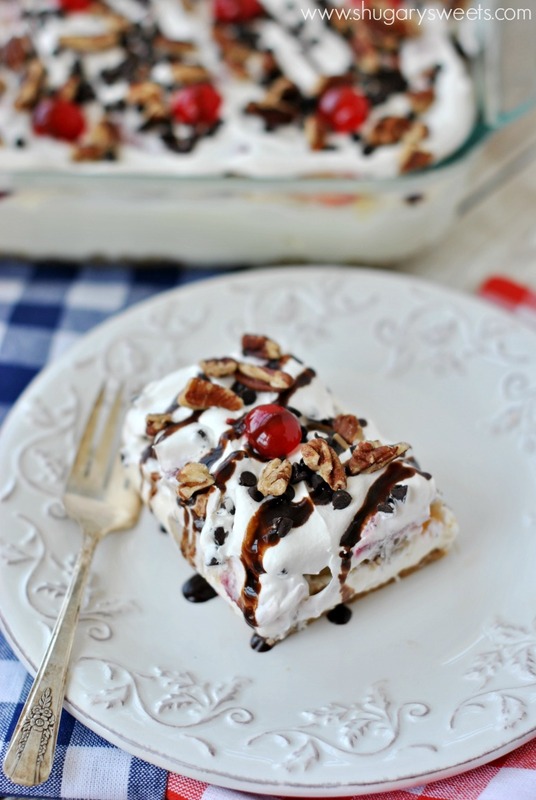 I love banana splits, too – these look amazing! While I’m not the biggest fan of banana split’s original form, these cheesecake bars look incredible! I don’t think I’ve ever seen so many takes on the banana split before, and some of these just look too good to pass up. I’ll have to give these a try! I love the switch up of pecans, sounds divine!! And yes more lettuce for me too… oh the horror! Banana Split & Cheesecake- Who could ask for anything more? This puts the best of both worlds into one dessert and for this I cannot wait to make it. I always forget how much I love cheesecake until I see it or read about it. Thanks for the post!